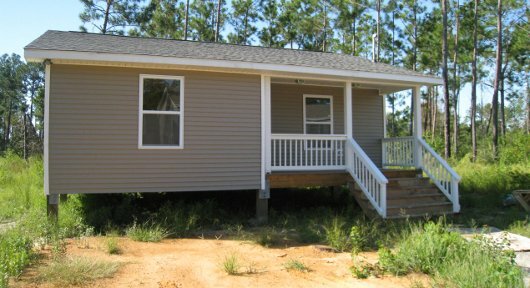 Brenda Williams lives in one of the homes built from the ground-up by our volunteers who continue to grace Lakeshore and the gulf coast with their dedication, hard work, and support. 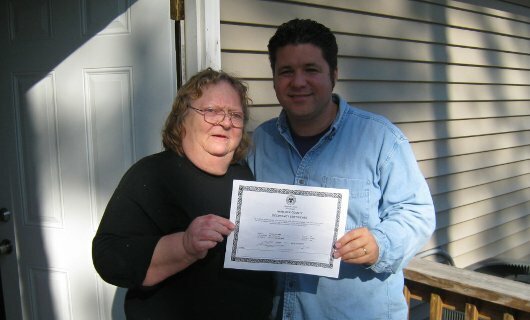 The picture above shows me presenting her “Certificate of Occupancy” after her home was completed. Yesterday she shared this note of appreciation and I wanted to pass it along to all of you. Thank you Lord, and to the Body of Christ, thank you! Thank you for this beautiful home, it is the most wonderful solid built house I have ever seen. Let me never take it for granted. I am not even a little bit worthy of all of this, and yet here I am, over joyed with your love, and the love of your people who don’t even know me. Sitting here I feel your presence Lord, your love, and all the love that went into every part of this house. Looking around I think of all those who took part in this wonderful work. Those who did all the planning, the paper work, phone calls, the grounds clearing, all those who worked in this hot, steaming, bug infested beautiful place we love and call home. They suffered all and sometimes more than we did, the lack of comforts, being away from their loved ones and homes. Hands bruised and cut, holding hammers, nails, saws and paint brushes. Backs and legs hurting and yet they worked on, plumbing, wiring, electrical fixtures and so much more. Not for a pay check, not for my little Thank- You! But for you Lord. In obedience to you Lord. Lord, I pray that this work brings Glory to you. Let your blessings be upon this beautiful place an upon your children, who brought it into being from the thoughts of it, to the completion of it all and more. Bless each and every one, who took part in all of this. And Lord let not one of them or their children ever go hungry or homeless. Lord, we were hungry and they fed us, we were without clothes and they clothed us, comfortless and they gave us comfort. Lord, I think you for Lakeshore Baptist Church, Pastor Don, and all the beautiful workers who so faithfully served and continue to serve those in need. For those who understand this devastation and the need for sometimes a hug and a prayer. My heart is so filled with thankfulness and love for you all. A beautiful picture of the heart of Christ.